How the Chicken stole Bawkmas. In north field, many years ago, when Puddleby was just settled, there lived a great white chicken. The chicken was often witnessed strutting around and puffing his feather out. Straight back and keen eyes, the chicken would bawk at little children and rush predators like foxweirs, ferals, and panthers. He was the main protector of all the chickens of the north field and did his job with impeccable style. Every four years, with the changing seasons and tides came great festivity in the new settlement. During this time the chicken would stand perched on a wooden fence looking townward, bawking all day and night at the loud noises and strange people in town. And one year, the year this legend was born, the chicken was so intent on bawking at the celebrations that he was unaware of predators killing the lessor of his kind in the north field. "Baawwwk?" The chicken questioned as he saw feathers scattered about the north field. Did I mention that this chicken was the most intelligent chicken in the history of all chickens? He very well knew what just happened. Sadly and softly the great white chicken bawked at his fallen brothers and sisters. So sad was the great chicken that he could not go on. He failed to "bawk" the predators away. And so the white chicken slowly and clumsily climbed to a perch on the tallest tree in north field. And with all his life the chicked bawked so loudly and hoarsely that it could be heard from the exile settlement. The celebrations stopped and all the exiles, old and newly born rushed to north field and saw the chicken standing on that tree bawking toward the heavens. All the people could hear his grief. And at once, suddenly, a great gust of wind blew and lightning crashed. The flash of light blinded everyone temporarily and when they could see, they thought white feathers were floating down upon them, but it was snow! The chicken was gone and his tree covered completely and thickly in great fluffy snow. And they went to the tree and found a place of snow, it became called snowy grove. 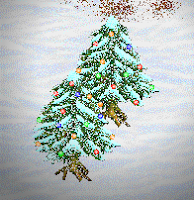 They called this time of season Bawkmas to remember the great white chicken and his absolute grief which gifted Puddleby a very snowy place. They say that the snow are white feathers from the heavens and they gently touch everyones cheek as a token of protection from the white chicken. The people of town place colorful lights on the snow trees as representation of the fallen chickens he failed to save... that here he could protect them for all time. If you listen carefully enough, some say that you can hear a very distant, but still distinct "Bawk" from high, high above the snowy grove. Suspicious Darshak Activity on KI. On a recent KI hunt we ran right into an elite darshak scouting party. We do not know what interest they have in KI but I decided to make this public as it might have a connection with the darshak on TI. We were very thankful for the natural land barrier that separated us. We killed a couple but didn't have time to finish them off as we almost all fell before leaving to north KI. Oh, I got lyfed again, joy. The team made our first exploration of the Western Keep today. The most important thing people will want to know is that we did not reach the end and we did not find anything of value. 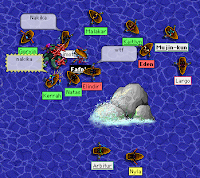 It was successful in that we reached further than before and managed to kill a significant amount of Watery Guardians, but along the journey we made many mistakes, one eventually significant enough to cause some departs and bring a end to the trip, followed by a short rescue. When we first entered the Western Keep about 8 Thoom fell within a single minute. 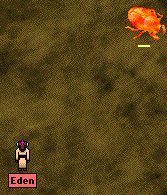 It was a bad start with a lot of water elementals at the entrance. 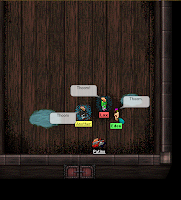 Eventually we were chained to safe room 1 and more Thoom joined the team. In the history of Puddleby I can say with confidence this was the single greatest gathering and cooperative effort of Thoom recorded. Once we got established, we cleared the first hallway rather quickly. Backspawns occur frequently, but not enough to overwhelm our team. After the first hallway we found a larger room with a lot of Watery Guardians. South we confirmed another hallway with what appears to be more safe rooms. 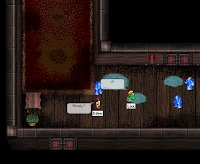 In the larger room, after the first hallway, the group became split-up by a kudzu mistake (by me) allowing four watery guardians into our safe spot. And with backspawns taking a toll on the survivors a couple of us were left fallen in the large room with no chance of a rescue. We learned a lot about future tactics that will lead to our eventual success. We are planning our next trip in two weekends, giving us more time to think, plan, and become stronger. At the entrance of the western keep. Safe room 1 visible to the north. We got kudzu setup which allowed for a effective way to kill the guardians. Not pictured is fighter and runner, Scout, who lured the guardians away, allowing kudzu to be placed without distractions. The room after the 1st hallway. Lots of Guardians. Here we faced a lot of icey lightning. This is as far as the team progressed. The big kudzu mistake is visible which allowed the guardians to come through and mark the end of our trip. We came back to rescue Scout in a safe room, after some departs and portaling to town from the previous sketch. A parting team shot of a successful first trip to the Western Keep. 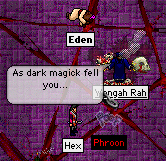 Healer: Another, Coriakin, Phroon, Xenos. Fighter: Eden, Genmo, Patino, Scout, Vanusanguia (BBer). Mystic: Kassaarh (apprentice), Org du Lac. It is not very often that I have the opportunity to hunt with both of my trainers, Natas and Mujin-kun, so when it does happen it is something I do not pass. From about the 3rd circle I have trained exclusively with both of these fighters and have learned a lot from them in ranks and also in critical fighting tactics for some of the most popular hunting spots in isles. I have also taken practical advice on training that I will pursue. To me, these two represent some of the most outstanding and skilled fighters in Puddleby, and they have pushed me further than I would sometimes push myself. Each has their own style, has acquired multiple ledgers and both passed the 8th circle fighter test. I tribute this entry to them, Natas and Mujin. Thanks for pushing me to the extent of my capacity and being there to help me get stronger through many, many hours of hunts at MI, Valley, KI, and more. It keeps me coming back for more. Santa has come to town and he can tell who has been naughty or nice. In jolly cheer and wearing the festive colors of Bawkmas he had a gift to give to every little boy and girl. Whether small or tiny, or common or rare, no gift request was too small or too big for Santa to handle. With a mighty bag full of gifts he spread cheer to all. This day was also full of fun and excitement in the badlands with my first ever game of Capture the Flag. My team won both games before the fun ended. Discussing tactics below. 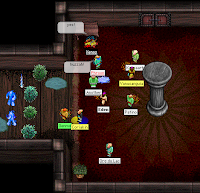 Lugubrion's Keep and Scouting Party. 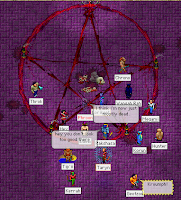 On 12/23/2007 a unplanned team of Thoom formed in Town Center to explore Lugubrion's Keep... In the recent weeks I became informed of Lugubrion's Keep, which was recently discovered and had Thoom only access. The western part of the keep had great danger and was left unexplored due to the difficulty of the monsters and the general lack of strong Thoom Fighters. Example of the proximity of safes room. This sketch is a little west after the entrance to the western keep. Safe room 2 and 3 visible in the sketch. Safe room 1 is a little bit further east and not quite as close as these doors are to each other. Just north of the last sketch. Safe room 4 can be seen. After this safe room 5 and 6 are very close to one another to the west. Water Burst is visible attacking me while Patino and I attempt to hit a Watery Guardian. This is west and south of the last sketch. Safe room 7 is visible and this is the first door the team encountered which was locked and caused me to fall. Not far south is safe room 8 which a team member successfully entered and confirmed safe. This is a far as we progressed. 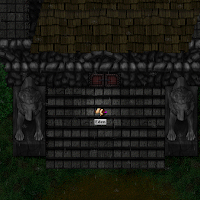 Example of a safe room. Safe room 2. Lugubrion Exploration Group is an attempt to form a more organized and coordinated Thoom effort to successfully explore and map the western reaches of Lugubrion's Keep. We also will search for alternative entrances for non-thooms. Read more by clicking the link at the beginning of the paragraph. It's beginning to look a lot like Bawkmas. It is true that the celebrations have begun. Now open in north field is the Snowy Grove and as you read this, many snow ball are being thrown among the the fluffs of snow. Eggnog can now be purchased and there is a minor quest to receive mittens. Nothing else to report right now but I will be producing a bawkmas special, a story, "How the Chicken Stole Bawkmas." It will be up when I finish it. Ha! The journey of the fallen named Phroon. To the extent of my knowledge Phroon had been fallen on Telebrion Isles for quite sometime with very little chance of rescue. 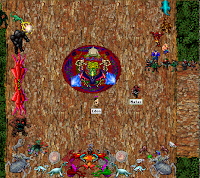 The full mystic Wangah Rah, present at the bard field bawkmas celebration opened a portal and rescued the fallen thoom healer. Wangah shortly admitted afterword that he "forgot" to close this portal and as a result a variety of the lower end undine found a way to enter and interrupt the concert. It was nothing of high concern but Wangah fell after closing the portal due to the heavy amount of summoning required by his ability. 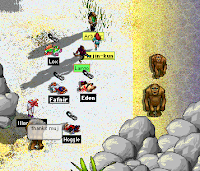 In town I watched as healers of all ages and abilities gathered around the fallen Phroon to save him. He remained PND, but still we waited. 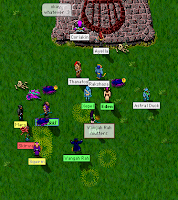 At one point, 21 healers were outside of the library (not all present of course but the majority were on Phroon). It was Wangah Rah who presented his Darkstone to us exiles. I am not trying to portray his actions as negative, for he waited along with all of us a significant amount of time and some healers were returning to the library in this hopeless situation. So we headed to Ash Isle. Phroon was raised as a corpse and felled and was healed but not fully for his spirit was still detached though his abilities seem unaffected to the naked eye. I have heard of darkstones but have never seen one in use like today. Outwardly it appeared the Wangah Rah benefited in some way from this experience. I think this event was of the utmost extreme and should never be done in any circumstance. It feels good to have a coin purse weighing me down once more. Today I hunted with Mujin-kun, who also began to train me again in Evus. We hunted KI Cove, MI passes and keep, and finished on Metz. I enjoyed Metz much more this time than all my prior experience. Not pictured above is the thoom healer, Xenos. I learned that I still have a lot of work ahead of me but it will be worth it and I am ready for the training. My goals: Obtain Evus and Detha ledgers, buy a great axe, buy or/win chains, pass the 6th circle fighter test, become the strongest fighter thoom. Soon after I passed the 5th circle test (read entry below) I became engaged in a wonderful conversation in the fighter hall with Tip'ii, Chrono, and Crunch. The topic of the night was one regarding the effectiveness of various trainers and the number of lessons to pursue. And like every exile, I expressed my opinion on the proper course of training. Soon after we found ourselves at the finale of what was probably a spectacular Jade Noids rescue. A matter of concern right now is the alarming number of Darshak around the shores of Telebrion's Isle. A number of exiles have fallen, and while the rescues have required no great effort, the general concern for the fallens there has been of minimal interest to all but some of the most demanding exiles (many of whom like Little Oss single-handedly rescue a substantial number of these fallens at their own great personal risk). Between these two events was quite a lot of activity in town center which took place after the Jades rescue. Drunken Zo's and Fen's could be seen falling to the slightest amount of alcohol in town center. We must be thankful that Puddleby is not paved for fear of worse injuries to these public disturbances. It was quite a day for me. And also of personal interest is that I have found another female fighting thoom, Squirm. Yes, it is true. The Warrior Thoom (me) made her (mine) long due return to the streets of Puddleby by passing the 5th circle fighter test in traditional style (without any of that subclass nonsense). It was as true as test as one could have and thanks to a lot of dedicated Natas-Detha training I have succeeded with a fraction of life left. This brings up interesting topics in which preferred method I will now dedicate my training. I think a healthy Evus-Detha-(Swengus/Regia) diet will satisfy my hungers. Oh, by the way, I bring good style to the red belts often seen on us 5th circlers. Good bye. Thoom! I came out of the library this morning, after quite a long time of studying to find a vermine attack taking place in the east-northern farm. I did not witness the beginning but when I arrived the large death vermine were on the assault and to my surprise, they were very well coordinated. 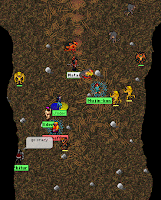 For example, they swarmed and attacked in a large collective group and would surround the fallen exiles, not even attacking other full health exiles standing nearby. With the recent harbinger events I question the relation of this attack to the harbingers. I checked the ruin (?) in east field after the attack and the countdown nears the end of its cycle. I only wonder if the countdown with be one more or all six. I was told before the attack the ruin read ::... perhaps we now approach the end. Anyway, I still exist and have been very busy, but foresee my return to my old self after a decent break. Not pictured in the above sketch is the smiling and really, really good looking fighter and bard, Measle. 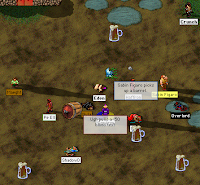 Anyway, on this day Fenix Fire offered its services to the often bored younger population of Puddleby. 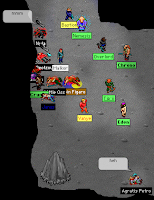 It began with Gremlins, Fafnir, and Myself, but quickly expanded and grew in sizes as new exiles from all the libraries overheard our highly publicized hunt through the sunstone network. It was a great success and the day was hard fought, but thankfully those weak in Atkus had significant boosts by the cloaked mystic, Muwe. His service helped move things along when we fought what some of the newer exiles called, "Orange Noids" (pictured above). We discussed the possible name selection further on such as tangerine and flame. This hunt was made all the better by those who came along with their teeth pullers. And in the end it was a good way for me to get out of the library for a while, where I have been stuck reading many classic Puddleby volumes and approaching bankruptcy. I remember on my homeland libraries being a free service. It is a hard life when all my income goes for book rent. I have now become called by some, Lazy Thoom. So maybe I am now the Lazy Warrior Thoom, I admit the lack of journal entries is the effect of being so lazy (too many books) and not being able to do those long hunts even when I do leave the library. I foresee not being invited for hunts if my behavior continues. I also think that in the certain future I plan on returning to myself. Fighting Thooms gather in TC. 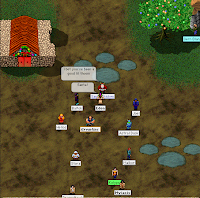 A small (or maybe large) portion of the fighting Thoom population gathered in Town Center and had a good time without any of the "other" races around. We yelled and shouted and Aymi and myself danced around Patino. We struck curious poses and at one point killed a rat! It was a impressive sight to behold in our matching Rockodile armor and it was the most fun I have had in TC in a long time. We tried tempt other fighting thooms from the library, but we failed and we didn't get to hold any flags! For that small fleeting glimpse of time, we, the fighting thooms, ruled Town Center. In my previous entry I briefly mentioned my return to the Sasquatch Valley. I really enjoy the hunts there because of the location and the quality of hunting. The spawns can be fun as shown in this sketch I made of 18 Young Sasquatch that came out to play. I tried to think of something clever to write, but that is all I got! This is kind of a excuse to post random sketches... Oh, I almost fell when I got this sketch. It would've been worth it though. 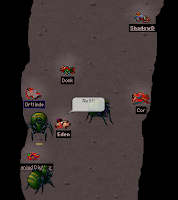 I have helped in a Jade Noids hunt that was created by the Ranger, Donk. He is going for the morph and is usually recruiting for these hunts when he is not studying. This was a great hunt that started with a lot of fighters and only two healers. By the time it was done the group had gained and lost probably around 10-15 exiles. I stayed because I liked the ranks. Eventually we became too confident and a rather nasty spawn felled all of us. Luckily, Mujin-kun and Nyla were available and a full rescue with them and others created the fastest rescue of Jade's that I have ever witnessed. And here are the sketches I promised of Natas' new tree-trophy house. Let us hope that town is never invaded by his collection of trophies. I think the house looks much better than his previous and it has a lot of room to be filled by the most vile and challenging animals of our isle chain. 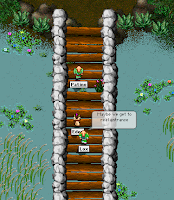 Initially I planned to write this about my return to hunting the Sasquatch Valley and Melabrion's Isle, but something else began as the group was finishing Mud Golem's. I first tuned in on my sunstone as Daimoth was tempting exiles of promises of snow and "new" animals at the Metz Cove. I played it false for a while but soon confirmed the events with one of my trainers, Natas. As Mud Golem's ended I was excited to join in on the foray. I raided the beach to find Yorilla's and other creatures of all shapes and sizes that I did not know the names of. I remember at one point a substantial number of Valley Panthers attacked the exiles, but were dispatched by very strong exiles in the speed and difficulty in which I compare me versus island panthers. Haha. I didn't even have time to wiff on a VP before they fell. New to me but to no one else was a Yorilla that could shake the ground on which we fought. I basically tagged some crap a couple of times and fell even more. There were multiple retreats to the water and two times a Nakika appeared. 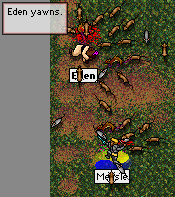 It was too hard for me to fight and Natas quickly chained the first one killed, adding it to his trophy collection. He purchased a new and larger home for the collection. I will get some sketches of those soon. Also impressive to me was the Champion, Garr, who did some great demonstrations of the Stone Girdle and Lava Cloak (Do any other Champions train these things?) During the retreat times some tension was visible between the upper class concerning the most effective and productive method to handle the situation. Maybe I am young, but I tend to prefer the famous Zo Charge tactic... I kept my mouth shut. When all was said and done I left and vowed to the others that I would return to assist when I passed 3 more fighter circle tests.